I have fond memories of the book fair at the annual Canadian Congress of the Humanities & Social Sciences. At the 1994 one, I learned from a Copp Clark rep that Chad Gaffield was putting together what would be the first collection of Canadian environmental history. So, unsolicited, I sent him a copy of an essay I’d written – kids, don’t try this at home! – and by the following year’s book fair I got to see it in Consuming Canada. Good times. 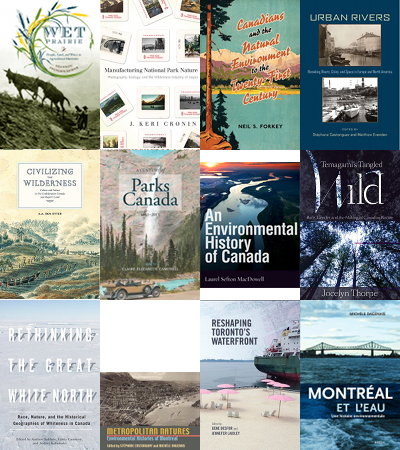 Wandering the aisles of the book fair last week, it was great to see that there are many more Canadian environmental history / historical geography titles coming out than ever before. Much of this is thanks to UBC Press’s Graeme Wynn-edited Nature/History/Society series, which has now reached 20 titles. This not just the strongest series in our subfield these days but may well be the strongest series in Canadian academic publishing, full stop. McGill-Queen’s has just launched a Rural, Wildland, and Resource Studies series edited by Colin Duncan, James Murton, and Ruth Sandwell. And (cough) I am editing the Canadian History & Environment series of edited collections with University of Calgary Press. Of course, there are many stand-alone titles, too. Here are some of the new (since 2011) books. First mention has to go to Shannon Stunden Bower’s Wet Prairie: Prairie, Land, and Water in Agricultural Manitoba, which last week won the Clio Prize for the Prairies. Congratulations, Shannon! (I’m also interested in reading the natural history book that just won the John A. Macdonald Prize, The Codex Canadensis and the Writings of Louis Nicolas, edited by Francois-Marc Gagnon). Jocelyn Thorpe’s Temagami’s Tangled Wild: Race, Gender, and the Making of Canadian Nature has appeared this spring. A collection that I should know more about, with a strong historical component, is Gene Desfor and Jennefer Laidley’s Reshaping Toronto’s Waterfront. A collection that The Globe and Mail has ensured I’ve heard more about is Andrew Baldwin, Laura Cameron, and Audrey Kobayashi’s Rethinking the Great White North: Race, Nature, and Historical Geographies of Whiteness in Canada. Stéphane Castonguay and Michèle Dagenais have had a great year: Castonguay and Matthew Evenden edited the just released Urban Rivers: Remaking Rivers, Cities, and Space in Europe and North America; Dagenais published Montréal et l’eau: Une histoire environnementale; and together they edited the great Metropolitan Natures: Environmental Histories of Montreal. I’m looking forward to reading AA Den Otter’s Civilizing the Wilderness: Culture and Nature in Pre-Confederation Canada and Rupert’s Land. Keri Cronin published Manufacturing National Park Nature: Photography, Ecology, and the Wilderness Industry of Jasper. I am also happy to report that Claire Campbell’s edited A Century of Parks Canada, 1911-2011 – notably, a book that is also available for free download – sold out its initial print run of 1000 in its first 12 months, so that more had to be printed. As Ecclesiastes 12:12 reminds us, there are always more titles forthcoming. For Canadian environmental history geeks, this summer’s The Girl with the Dragon Tattoo is either Neil Forkey’s Canadians and the Natural Environment to the Twenty-First Century or Laurel Sefton MacDowell’s An Environmental History of Canada, or both. If the publication of these two overviews makes us feel that we’re getting a good hold on the field, I predict John Riley’s forthcoming The Once and Future Great Lakes Country will usefully put us back on our heels. Did I miss any 2011 or 2012 titles in Canadian historical geography / environmental history? Undoubtedly, so drop me a line. I want to be sure to appear on next year’s version of this list, but I’ll make time for reading as well. PS: Don Lafreniere alerted me to a book I’ve forgotten, a book he believes “will become a classic in historical geography:” Sherry Olson and Patricia Thornton’s Peopling the North American City: Montreal, 1840-1900.